Fireworks 30 Sound Pack. Preview six samples from the sound pack above. 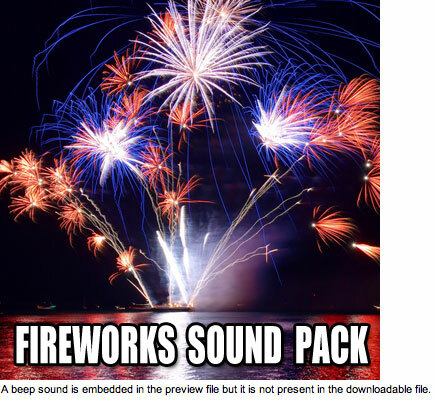 Description: Includes 30 individual professionally produced firework sound effects in both .Wav and .Mp3 formats. The individual sounds inside the downloadable zip file are separated. A beep sound is embedded in the audio preview file but it is not present in the high resolution downloadable sound files. By purchasing this sound pack, you are allowed to use the sounds royalty free in your projects such as films, videos, games, presentations, animations, stage plays, radio plays, web videos, new media and multimedia projects, be it for commercial or private use. This sound pack is created by Sound Jay and protected under the copyright laws. You are not allowed to post the sound effects alone on any web site for others to download or sell, license or sub-license the sound effects to anyone else. thanks, really help my student film! !